What Does DFTBA Mean, Anyway? DFTBA is one of those acronyms that has too many letters to just flat out guess what it means and have any chance of being somewhat accurate. Besides that, the catchphrase itself isn't spoken as often as some of the other popular ones out there (like TFW, YOLO, etc. ), making it doubly confusing to try and interpret it. The meaning of DFTBA is super straightforward. It's not always possible to be awesome all the time, so it's worth motivating others to step up their awesomeness when they most need it. DFTBA is typically used as an open-ended, positive reminder to "do your thing" — whatever that may be. The acronym itself isn't often stuffed in another sentence as a way to save space and type something out fast. Instead, people like to use it by putting it at the end of a post or comment as a nice way to wrap up and close what they're saying. "Everything happens for a reason. DFTBA." "Hope you all have a great day! Also, DFTBA." 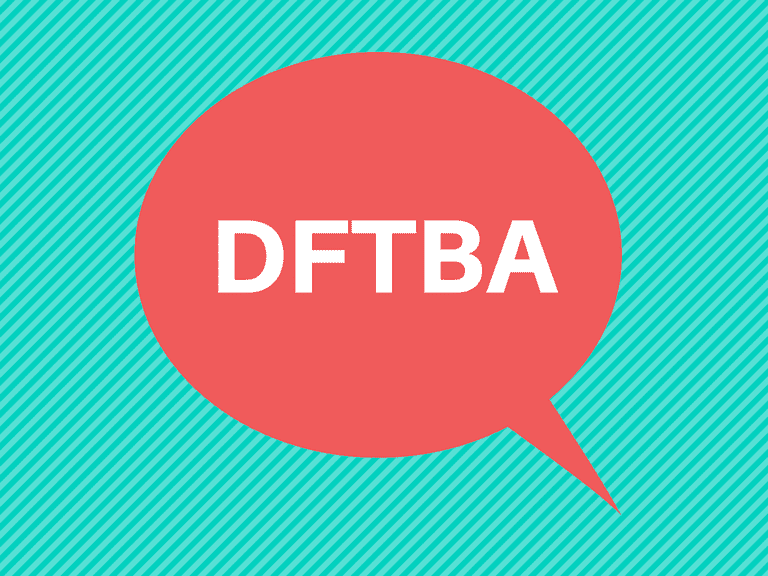 DFTBA was largely popularized by the YouTube duo Hank and John Green — a.k.a. the Vlogbrothers. The catchphrase serves as the motto for their fanbase of "Nerdfighters," called "Nerdfighteria." In 2008, Hank Green co-founded an independent record label and called it DFTBA Records. The goal was to use it as a distribution network for rising YouTube stars and artists who were looking to reach more people and build up their fanbases. Since then, the record label has expanded to become a merchandise company for YouTubers looking to sell their own branded clothing, posters, mugs, calendars, wristbands and more. The company has helped dozens of YouTubers fund their work enough to be able to do it full-time. Although it was the Vlogbrothers who popularized the DFTBA acronym and catchphrase across the YouTube community and other parts of the social web, they weren't the ones who invented it. In 2013, John Green uploaded a video on the Vlogbrothers channel addressing the question of ownership for the DFTBA acronym/catchphrase. In the video, Green pointed out that several other companies not affiliated with the Vlogbrothers or DFTBA Records have put the DFTBA acronym on their products. While the brothers aren't exactly happy about it, they've decided not to trademark the acronym because it would mean that they couldn't selectively prevent certain companies from using it. By trademarking the acronym/catchphrase, members of the Nerdfighteria fanbase also wouldn't be able to create DFTBA-inspired pieces or art to sell on Etsy and other e-commerce platforms, which Green says he would prefer to support. So even though DFTBA is most closely associated with the Vlogbrothers and the Nerdfighteria fanbase, nobody truly "owns" it and anyone can use it however they want.